To celebrate the festive season, Four Seasons Morocco Collection introduces the Tar-Bûche, pronounced “tarboosh,” an original and unexpected pastry creation that pays homage to local culture. Executive Chef Thierry Papillier draws inspiration from the traditional local men’s headwear commonly referred to as the tarboosh, or fez hat, in a version of the popular festive treat known as bûche de Noël or Yule log. The colours evoke the Red City of Marrakech and the White City of Casablanca. For its flavours, Papillier combines original aromas to create a truly unique work of culinary art. The delicious sweet base is composed of chocolate brownie with a twist of amlou, a delicious Moroccan dip made from toasted almonds, argan oil and honey. The cake is coated in a layer of chocolate biscuit and crunchy praline, covered with a rich chocolate mousse enhanced by an unexpected zest of lemon confit. Sprinkled with gold and silver powder, this original creation will undoubtedly exude elegance for festive season gatherings. From its creative form to its original taste, the Tar-Bûche of Four Seasons Morocco Collection should be savoured without moderation with loved ones or friends. 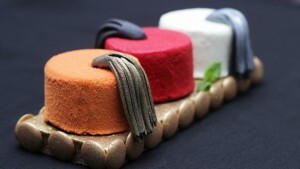 In the Red City, order the Tar-Bûche 48 hours in advanced by calling Four Seasons Resort Marrakech at +212 524 359 200. In the White City, purchase the Tar-Bûche at the Pasty Corner of Mint Lounge at Four Seasons Hotel Casablanca. This special edition creation, which serves up to six people is available from December 10 to 31, 2016 at a price of MAD 360.